The Ninja® Professional Blender is a professional, high-powered innovative tool with a sleek design and outstanding performance, a true asset to any kitchen. It is perfect for ice crushing, blending, pureeing, and controlled processing. It explodes ice into snow in the blink of an eye and minces whole fruits and vegetables evenly. The Ninja Professional Blender also features an extra-large 72oz BPA-free pitcher that allows you to serve more guests with less work. Try out this must-have summer appliances at your next cook out or picnic to make delicious recipes like these: Strawberry Banana Smoothies, Frozen Pomegranate Margaritas, Tangy Summer Fruit Salad and Kansas City BBQ Sauce. I am a HUGE fan of Ninja appliances because they are so innovative, powerful, and really clean and sleek! This Professional Blender is no exception! It is amazing how powerful it is - no more having to wait minutes to crush ice or mix a drink. It literally takes seconds! 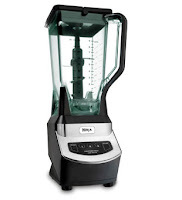 And there are so many great recipes and drinks you can make with this blender! Some of my favorites (found on the Ninja site) are Hot Artichoke Dip, Fruit Salad and BBQ sauce! Make sure to check out the great recipes Ninja offers to you - you might just find a new favorite! I recommend the Ninja Professional Blender for all chefs in your house! You will love how powerful and quickly the Ninja Blender mixes everything and how many different drinks and food recipes you can make with this blender! Buy It: You can purchase the Ninja Professional Blender for $99.99 at Kohl's, Target, and Bed Bath &amp; Beyond and at Canadian Tire in Canada! I joined the Alexa hop....I was already a follower! I did just add your button to my blog! Love to have you hop over if you get a chance! Found you through Monkey Blog Hop and am following you! Please drop by neck of the woods http://tonithechicmomma.blogspot.com/ sometime!